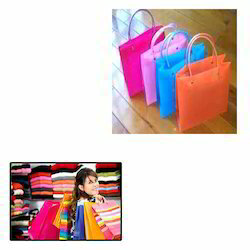 We are a leading Manufacturer of pp bags for shopping from Delhi, India. Being a quality driven organization, we are engaged in manufacturing, supplying and trading PP Bags for Shopping. Available in different colors and sizes, these bags are widely demanded by shops, showrooms and malls for packing garments. All the bags can also be customized as per the demands and needs provided to customers.